Sarah Drew, who portrays the role of April Kepner in the long-running ABC medical drama Grey's Anatomy might leave the show. Grey's Anatomy appears to have dropped a hint on how Drew is leaving the show during Thursday night, May 3 - show. On Thursday's episode, a promo for next week's show revealed that April Kepner is somehow gravely injured and the doctors of the show had to struggle to save Kepner. With Jackson Avery (Jesse Williams) seen crying over Kepner's body as a machine behind him shows she's flatlined. In March, EW confirmed that Drew and Jessica Capshaw are going to leave the show at the end of the season 14. 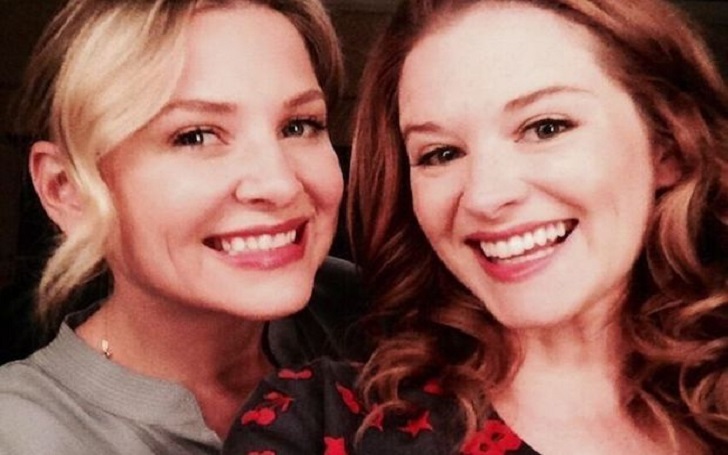 Drew joined the cast of Grey's Anatomy in season 6 as April Kepner, a transfer from Mercy West and was upped to series regular since season 7, while Capshaw joined the cast as Arizona Robbins in season 5 and was a regular cast since season 6.
said Grey’s creator and executive producer Shonda Rhimes of the fan-favorite characters.